Mohamed Abul-Ghar is the head of the Egyptian Social Democratic Party, which he co-founded with other activists and public figures after the January 25 Revolution. 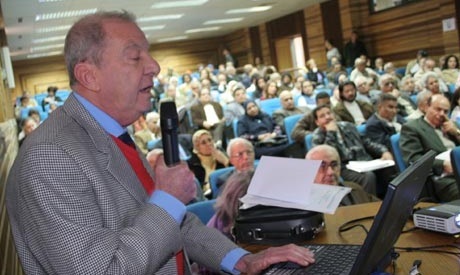 In 1962, Abul-Ghar graduated from the Faculty of Medicine at Cairo University and obtained his PhD in 1969, specializing in obstetrics and gynecology. Besides his teaching post at Cairo University, Abul-Ghar pursued an active career in scientific research. HeestablishedEgypt’s first specialized medical center for assisted fertility in 1986. Though interested in politics since youth, Abul-Ghar became actively involved in politics during the Mubarak era. In 2004, Abul-Ghar and other university professors founded the 9 March Movement for the Independence of Universities. This groupseeks to defend academic freedoms and to protect universities from the intervention of state security agencies, as well as academic corruption and discrimination. Unwittingly, the group became part of a more general pro-democracy movement, staging its first demonstration months after Kefaya (Enough) protest movement staged theirs against the perpetuation of the Mubarak regime. Nevertheless, the 9 March Movement’s dissent has and continues to specifically target conditions and regime practices inside universities. Abul-Ghar was directly involved in anti-regime opposition before the January 25 Revolution. He was a coordinatorand spokesperson for the National Association for Change (NAC), which put him on the front lines of political opposition before the revolution erupted in January 2011. Led by presidential hopeful Mohamed ElBaradei, the NAC was formed in early 2010 as a loose coalition of various political actors who pushed for substantiatve democratic reforms that would allow viable candidates outside the ruling party, like ElBaradei, a fair shot at contesting in a presidential election. The group was seen at the time as an attempt by opposition forces to resist apparentefforts by the former regime to groom Mubarak’s influential son, Gamal, as his father’s presidential successor. Prior to the beginning of mass protests in January, Abul-Ghar’s anti-regime tone was harsh, strongly attackingthe state after Church bombings killed tens of people in Alexandria on New Year’s Eve. That January, he joined a group of ex-members of parliament, public figures, and youth representatives to form a “parallelparliament”, shadowing the work of Egypt’s actual parliament, which came to power in 2010 through elections that most observers declared fraudulent. This alternative parliament was to independently review bills and recommend legislation in parallel to the official one. Mohamed Abul-Ghar participated in the 25 January protests and the eighteen-day uprising, which ended with the toppling of former President Hosni Mubarak. On the first day of protests, Abul-Ghar warned the regime of the tremendous amount of anger that would be unleashed if the government failed to respond with serious reforms, including dissolution of the parliament and measures to control soaring prices. After Mubarak’s demise, Abul-Ghar helped form the Egyptian Social Democratic Party and became its interim leader. Modeled after European social democratic parties, the party champions social justice and democratic change. Abul-Ghar continues to be active in the 9 March Movement, supportingstudent protests, pushing for the removal of deansaffiliated with the ex-Mubarak regime, and rejecting continued intervention by government security agencies in university affairs. Abul-Ghar will not run for parliament in the upcoming elections.